Truly a great home at $484,400, whereby Passers by will appreciate the elegant exterior of this luxury new home, and those who enter will enjoy the subtle ambience created by our designers. A fresh approach to new home design has evolved into a home of style that will withstand the test of time. The innovation of the design is evident the moment you approach the Juliet balcony above the classical entrance with bevelled glass French doors. The central wrought iron staircase is the focal point from the study and lounge room, divided by more bevelled glass French doors leading to a semi-formal dining area and designer kitchen. Expansive family and games rooms are complimented by a large activity room on the upper floor with forward views and three children’s bedrooms (A reverse upper plan is available). And then the master suite has balcony access and an oval spa ensuite that opens via cedar shutters to the bedroom. The opulence is further enhanced by mirror doors to the walk-in-robe. Exquisite. 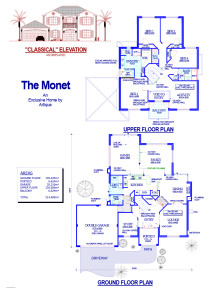 The Monet is a luxury two storey home worthy of a name that references one of the great masters, by a Perth home builder dedicated to faultless craftsmanship. 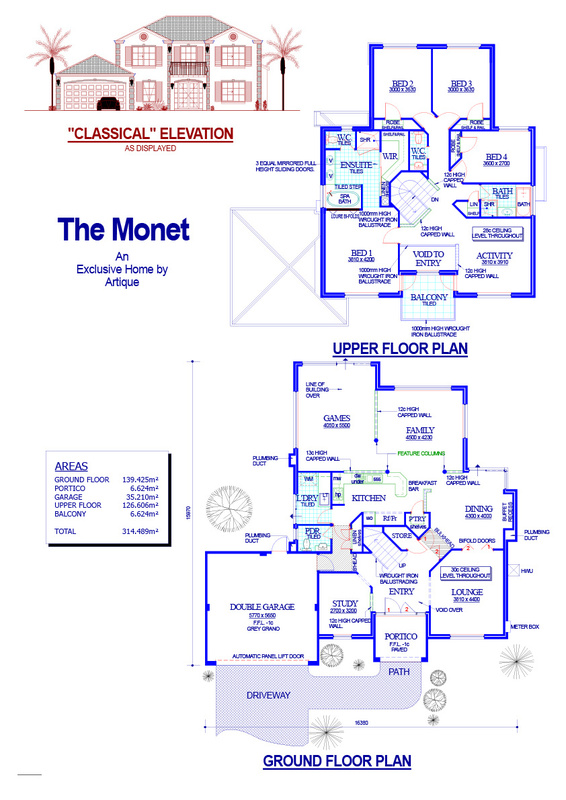 Contact Artique today to discuss this home or a Custom design incorporating your ideas.